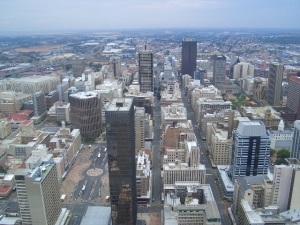 It being the largest city in South Africa, there is no surprise that Johannesburg is the best serviced by intercity buses; with a plethora of routes covered. The most common bus stop in Johannesburg (for intercity buses) is at Park City Transit Centre, also known as "Johannesburg Park Station", which is in Braamfontein on the corner of Leyds & Loveday Streets, with access from Rissik Street. a Gautrain Park Station connection below Wolmarans and Smit streets. Shosholoza Meyl long distance train services, and Premier Classe. You can phone Greyhound at 011 611 8000 or 083 915 9000.